There are plenty of reasons to be thankful to live and work in the 21st century; modern technology, healthcare, and battery powered coffee thermos that keep your coffee hot for hours, to name a few. 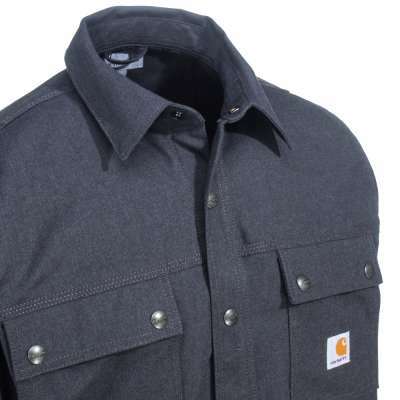 But one new benefits to adding to that list is the new line of Carhartt Full Swing workwear. 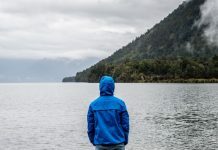 The brain child of years of research, the Full Swing line that includes jackets, work shirts, and pants, addresses the restriction of movement problem many hard-working people face. This is especially true when your job or hobby has you in more extreme positions. 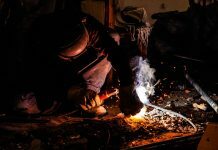 When you’re swinging an axe, shooting a bow, bending, crouching, reaching, or otherwise stretching yourself to the limit, you don’t want to hear that dreaded “rrrriiipppp” of the main seams of your work clothes. Nor do you want to feel the tight, binding seams digging into your skin and reducing your ability to complete the task at hand. Carhartt knows this is a problem for many working people. Not only can it be embarrassing and potentially detrimental to your work, it’s also uncomfortable. You work hard enough to deserve some comfort in your day wherever you can find it. That’s why the designers at Carhartt set out to find the secret to flexible, comfortable work clothing that offers even more range of motion without adding extra bulk to your workwear. The Full Swing line by Carhartt is very, very new, so more products are coming available each week, and even more will be added to our site very soon as well. Carhartt’s Full Swing line up is developed from a slight change to the material, adding a few more flexible fibers into the mix for more stretch and unique seam designs. Adding a little extra Spandex to the fabrics adds immense amounts of stretch without sacrificing durability. 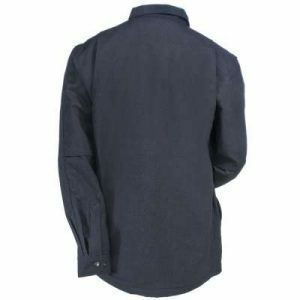 The Carhartt Men’s 101751 029 Full Swing Overland Shirt Jacket is just one of many Full Swing options by Carhartt. 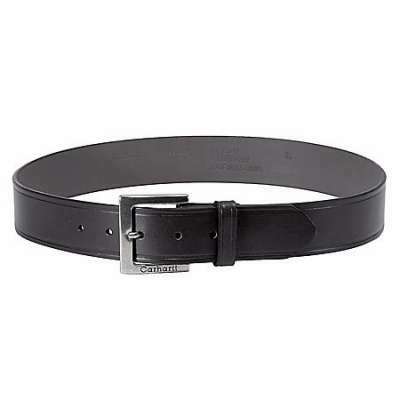 This “Rugged Flex” material is gaining rave reviews for the level of comfort customers are experiencing, thanks to the added stretch. But Carhartt didn’t stop there; a little extra Spandex is helpful, but not perfect when you want to swing an axe. But when you add the Mighty Back bi-swing back, generous pleats that expand when you reach and fall back into place when you’re relaxed to reduce bulk, you have one roomy and comfortable jacket. Other features such as the Flex Elbow and Freedom Underarm Gusset offer even more room to move on certain products. The Mighty Back bi-swing back does not add bulk to the shoulders of this shirt jacket. 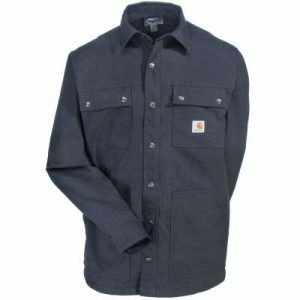 This featured Full Swing Shirt, the Carhartt Men’s 101751 029 Full Swing Overland Shirt Jacket, is not only flexible and roomy, but also water-repellent and durable. And don’t forget to add your company logo with our custom embroidery! Check out our full line of Carhartt Full Swing options here. And check back with us in a few weeks, too, as Working Person’s Store will be adding more products for you! Previous articleComposite Safety Toe Caps: What Are They?